Adobe has shocked its users of Creative Suite by announcing a plan to change the way its consumers pay for products in the future. Instead of purchasing standalone versions of Adobe’s Creative Suite package, which bundles together programs such as Photoshop, Illustrator, Dreamweaver and Premiere, users will soon be given no choice but to rent the software from Adobe on a month-by-month basis. This pay-as-you-go approach to using Adobe products will allow the company to move away from its typical 18-24 month upgrade cycle, with subscribers to Adobe’s Creative Cloud (CC) service being able to take advantage of the very latest upgrades and developments as they’re released. Access to the full suite of the programs from Adobe’s new Creative Cloud service will cost £47 per month, although an upgrade offer of £27 per month will be made available for those who already own a version of Creative Suite 3 or later. Renting a single application from Adobe, such as Photoshop, will cost £18 per month or £216 per year – a third of the price of buying a copy of Photoshop CS6 outright. The pay-as-you-go service will allow users to run the software offline provided that the programs are verified with the Adobe servers once a month, but it will result in it being more expensive for consumers of professional Adobe products in the long run. Thankfully, two photography-related products which are yet to fall into the new subscription model are Photoshop Elements and Lightroom. Both of these are expected to remain as standalone versions, and Adobe has already stressed that there are no plans to make Lightroom subscription only. 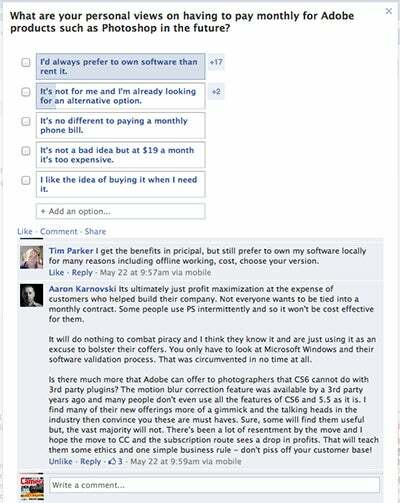 After launching an online poll on the What Digital Camera Facebook account, a majority of Photoshop users agreed that they’d always prefer to own software rather than renting it as and when required. Other What Digital Camera Facebook users made their feelings known in a string of comments listed below the poll. These can be read by heading to the WDC Facebook page.